This trail is 15 miles point to point or 30 miles as an out and back. This is really dependent on how fast of a runner you are, but the average time to complete the 15-mile point to point is anywhere between two and three hours. 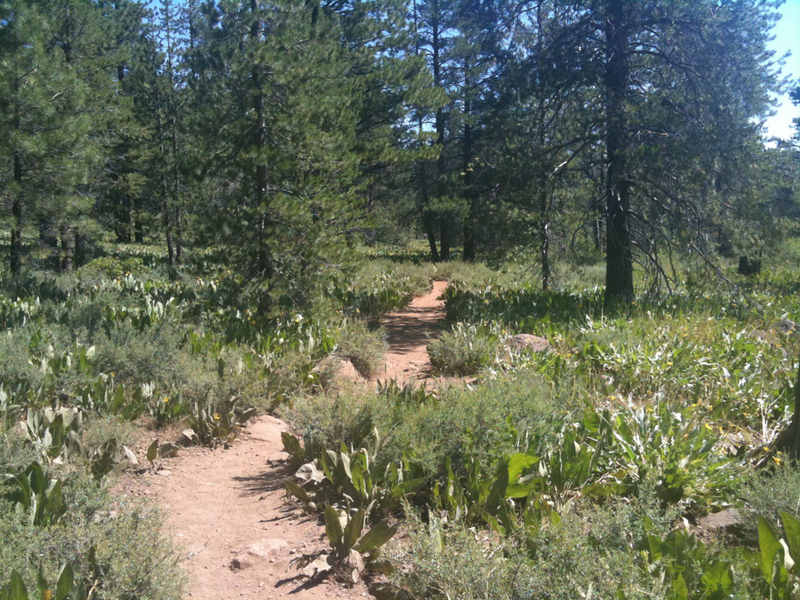 Most trails in North Lake Tahoe head the same direction: uphill. And while alpine climbs to viewpoints are never a bad thing, sometimes every runner needs a change. That change is the Commemorative Overland Emigrant Trail. For 15 miles the Emigrant Trail rolls up and down from the backside of Tahoe Donner all the way to Stampede Reservoir. 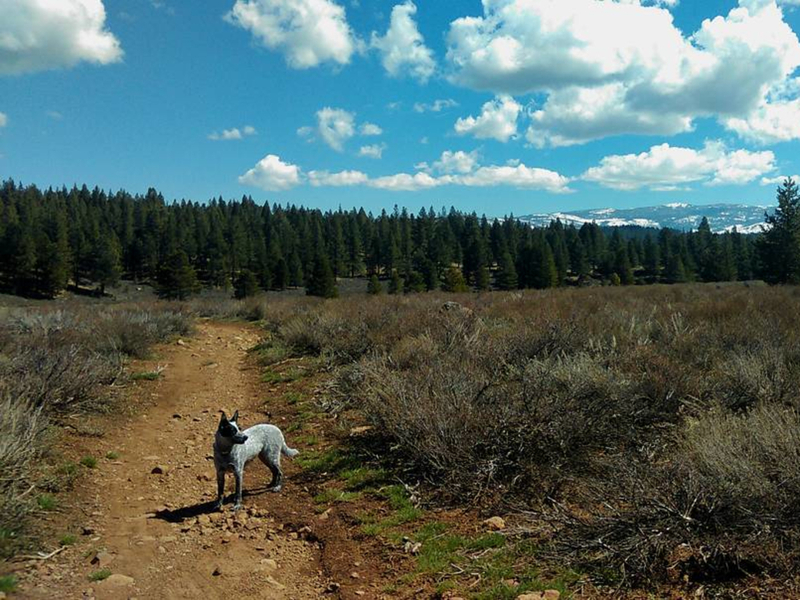 The trail crosses through sagebrush flats, creeks, meadows, and the dappled light of Ponderosa Pine groves. The Emigrant Trail can be run in segments, as a 15-mile shuttle, or as a 30-mile out-and-back epic. The first 3.6-mile section of the Emigrant Trail starts on the backside of the Tahoe Donner community, north of Truckee. The majority of this section of the trail, an easy, downhill grade, parallels and crosses Alder Creek. Aspens, pines, and green willow line the route. Look for beaver ponds pooling the creek. The trail crosses Shushing Drive and Alder Creek Drive before crossing Highway 89 at 3.6 miles. Note: Runners with dogs should be on the lookout for these three crossings. The second section of the Emigrant Trail begins on the other side of Highway 89 at the Donner Camp Picnic Area. This section of trail rolls through sagebrush and Ponderosa Pine forest with views of Prosser Reservoir. Near mile 6 the trail crosses Prosser Creek utilizing the Highway 89 shoulder and crossing. Note: runners with dogs should be aware of this crossing. Beyond Prosser creek, the trail steadily climbs out of the Prosser Reservoir area. More meadows, sagebrush, and views of Mount Rose lie ahead. The last section of trail begins at the crossing of Hobart Mills Road almost 10 miles into the trail. Note: Runners with dogs should be aware of this crossing. This third section is the least utilized portion of the trail. The occasional large, old growth Ponderosa Pine overhangs the trail. Look for red-tailed hawks, mule deer, and curious coyotes peering over the sage. The trail ends at the Stampede Reservoir Boat Launch Overflow parking. Note: a short trail breaks off to runner right just under a ½ mile from trail’s end; this fork leads to a small trailhead parking area just off Dog Valley Road adjacent to Logger Campground. Those looking for a long, rolling, wide-open run will love this trail. And those runners that are looking to squeeze in a few more autumn miles even though the high country has been snowed in. The second and third sections of the Emigrant Trail are usually snow free until December or January. The same can be said of spring; the Emigrant Trail is one of the first trails beckoning while the Pacific Crest still thaws. 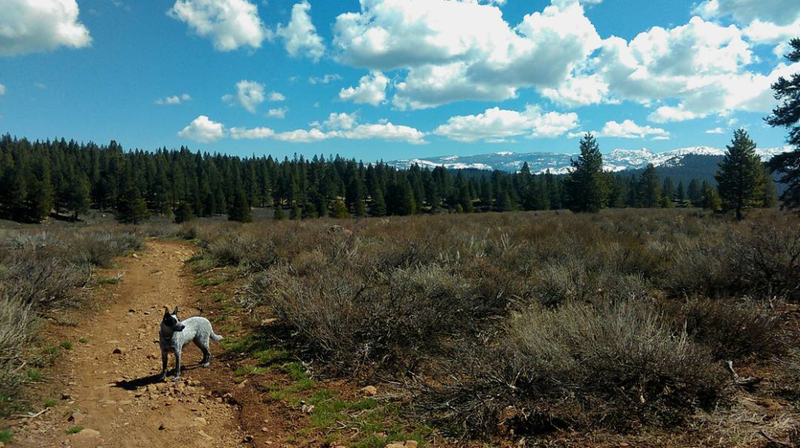 This trail is a popular mountain biking trail both early and late season for the same reasons –mid summer evenings, though, can be as beautiful on the Emigrant Trail as they are free of bikers. To access the first section: Take Highway 89 north of Interstate-80 for 2.3 miles and turn left onto Alder Creek Road. Proceed up Alder Creek Road for approximately 3 miles. There is a small trailhead on your left just opposite of the entrance to the Carpenter Valley road (Forest Service Road 780-12). Parking is free. To access the second section: Take Highway 89 north of Interstate-80 for 3 miles and turn right into the Donner Camp Picnic Area. Parking is free. To access the third section: Take Interstate-80 for approximately 7 miles east to the Hirschdale exit. Take this exit, cross under the interstate, and follow the Stampede Road (County Road 894) for approximately 9 miles. It will turn into County Road 270. Turn left (west) onto Dog Valley Road (County Road 261). Cross the Stampede Dam and proceed for approximately 2.5 miles until the pavement ends. This is the location of the small Trailhead and parking area referred to in the section three description. The trail from the parking area intersects the Emigrant Trail within less than ½ mile. Parking is free.